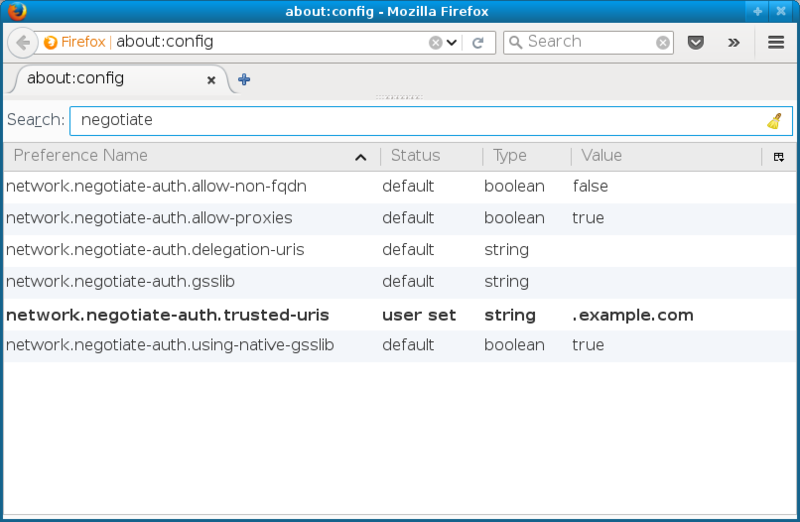 Users can enable Kerberos single sign-on (SSO) authentication using preference in their browser profile but it's also possible to set the default for all Firefox users on the system. During my ApacheCon talk this year, one of the questions from the audience focused on Kerberos authentication in Web browsers, which needs to be explicitly enabled, and specifically how to do that for all users in the organization. Firefox users may change the preferences of their profiles using Edit → Preferences, which in latest Firefox versions actually leads to about:preferences page. However, preferences related to the Negotiate HTTP authentication which is the mechanism used for GSS-API and Kerberos authentication are not here but in about:config page which lists all options in tabular form. The option we are looking for is network.negotiate-auth.trusted-uris. Users can set it to contain comma-separated list of domains or URL prefixes for which the Negotiate HTTP authentication should be attempted. For Kerberos it means that when accessing site matching the domain or URL and if the request is met with HTTP status 401 Unauthorized and HTTP response header WWW-Authenticate: Negotiate, the browser will check the Kerberos ticket cache and if it finds ticket-granting ticket for realm corresponding to the domain (check /etc/krb5.conf), it will attempt to get service ticket for HTTP/ service. It then retries the request with the GSS-API data containing the service ticket, which the server verifies and authenticates the user. 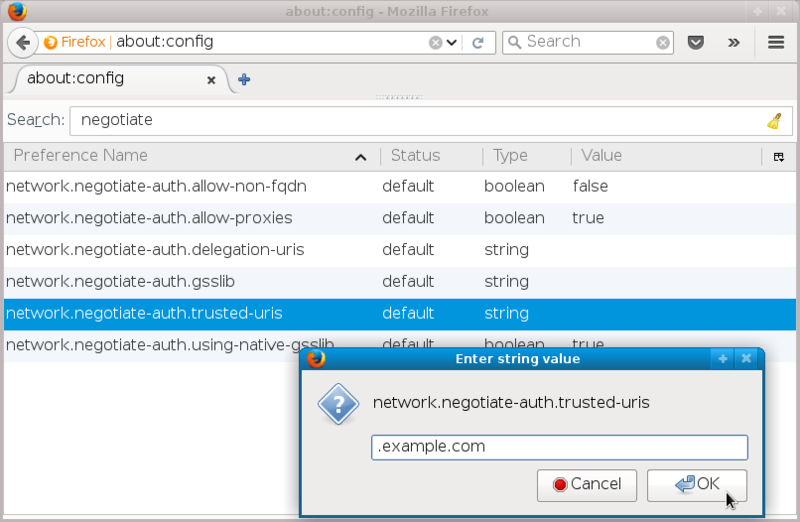 Or in simpler terms, the browser will use Kerberos authentication against servers that support it and that match the domain or URL prefix in the network.negotiate-auth.trusted-uris list, for example www.example.com. in some .js file in that directory. Configuration management will work and so will distributing that file packaged in rpm — check a .spec file which can be used to build configuration rpm for your organization. Note that the value .example.com is now marked as default. The user can still modify the value in their profile, to perhaps add additional domains, but if they Reset the value (right click on the line brings the menu), it will revert to this default value. There are also additional network.negotiate-auth. 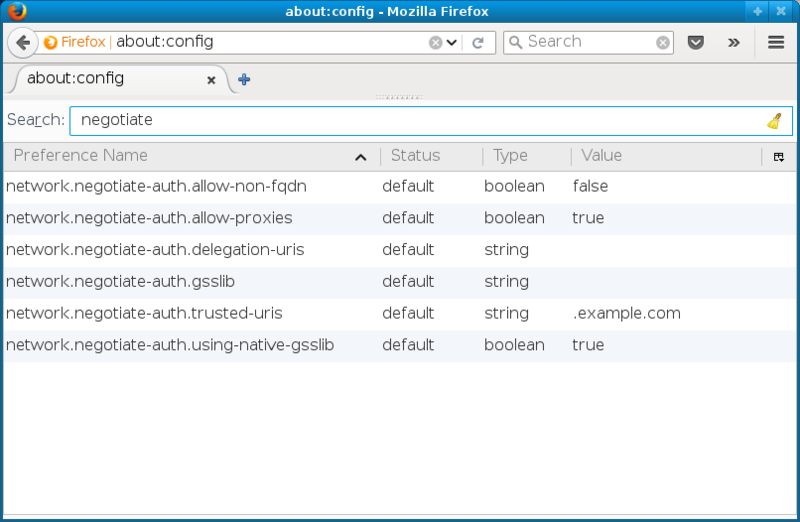 * value configured in that file but they just repeat the defaults that are already there on latest Firefox versions.